(KRT)—Jennifer Mirisciotti—and her custom-painted pink-and-white Xbox—represents the growing number of women who are hard-core gamers. Women make up 43 percent of all video game players, according to the 2005 survey by the Entertainment Software Association. That’s up from 38 percent in a similar survey in 2003. Though women aren’t quite yet the majority among game players, they’re involved in 55 percent of all game-buying decisions, according to the association of the video game makers. And many gamers believe that women have come a long, long way in their abilities. “I have found that 90 percent of the women I play against/with are better than average players or downright awesome,” said Lora Day of Melvindale, Mich.
Not too surprising, considering that both her mother and her younger sister also play. There are also a surprising number of women who play after having picked up a controller or mouse later in life when they saw others enjoying it. But with hard-core games—titles where you shell out big bucks as opposed to those oh-so-addictive casual games on web sites or Xbox Live Arcade—the number of female players drops to about 1 in 5. Violence specifically portrayed against women, patronizing “pink” video games marketed exclusively for girls and other gaming faux pas tend to drive women away. Still, the percentage of women in the industry is growing rapidly, with analysts agreeing that gaming companies are working to increase their gender diversity. The number of women in the industry has risen from 5 percent to 11.5 percent in the last few years, according to the International Game Developers Association. But the majority are employed in marketing, operations and human resources, not game development. Pinball Machine Sale at The Game Gallery... all refurbished pinball machines in stock get 5%off and get FREE SHIPPING... This offer good today only.. go on-line at www.PinballMachines4Sale.com and view and call us to see if the one you want is in stock. Call 1-800-966-9873. Also ask about our new Multicade Arcade Game with 25 of all the best classic games in one beautiful cabinet, buy one today and get free shipping too..
Ahh it was not to be once again. 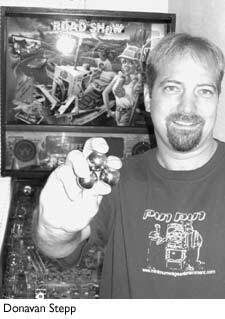 The Denver Post has published a follow-up to their story about western pinhead Donavan Stepp and his recent efforts at the Rocky Mountain Pinball Showdown.It seems Stepp was again so close and yet so far, but did manage to place second with 25 million points on Stern's World Poker Tour.First place went to Brian Shepard with 60 million points.Donavan does get around though. While I was looking for a different picture I found the one at left along with an article about Stepp in the Boulder Weekly from 2004.